Clarence Decatur "C. D." Howe, PC (15 January 1886 – 31 December 1960) was a powerful Canadian Cabinet minister, representing the Liberal Party. 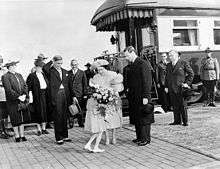 Howe served in the governments of Prime Ministers William Lyon Mackenzie King and Louis St. Laurent continuously from 1935 to 1957. He is credited with transforming the Canadian economy from agriculture-based to industrial. During the Second World War, his involvement in the war effort was so extensive that he was nicknamed the "Minister of Everything." Born in Massachusetts, Howe moved to Nova Scotia as a young adult to take up a professorship at Dalhousie University. After working for the Canadian government as an engineer, he began his own firm, and became a wealthy man. In 1935, he was recruited as a Liberal candidate for the Canadian House of Commons by then Opposition leader Mackenzie King. The Liberals won the election in a landslide, and Howe won his seat. Mackenzie King appointed him to the Cabinet. There, he took major parts in many new enterprises, including the founding of the Canadian Broadcasting Corporation (CBC) and Trans-Canada Air Lines (today Air Canada). When World War II began in 1939, Howe played a crucial role in Canada's war effort, and recruited many corporate executives (as "dollar-a-year-men") to serve as executives in wartime enterprises. Clarence did well in school, and upon his graduation from Waltham High School in 1903, he took the entrance examinations for the Massachusetts Institute of Technology. He passed, and after taking basic courses at the school, did advanced work in engineering. During the summers, he worked for J.B. Worcester & Co., a firm which had constructed much of the Boston subway system. While at school, he became a favourite pupil of Professor George Swain; after Howe graduated in 1907, Swain offered Howe a job as his teaching assistant. Howe accepted, although the young engineer felt that he should leave the Boston area to begin his career. Soon afterwards, Howe was offered an opportunity to become an engineering professor at Dalhousie University in Halifax, Nova Scotia. A popular story about Howe was that Swain had Howe and fellow engineer James Barker toss a coin to see who would get the job. Barker denied the tale later in life, stating he had no interest in the position and no one who knew Howe would be foolish enough to gamble with him, as Howe had shown himself to be uncommonly lucky. In any event, Howe had no better prospects in sight; unemployment among his classmates was high due to the Panic of 1907. Howe's department, in which he was assisted by his "dollar-a-year men", top managers in Canadian business, loaned to the government by their companies for a token payment of one dollar a year—their firms maintained them on their payrolls. [lower-alpha 4] Even before the department was formally established, Howe's representatives were surveying the country for essential war needs, with the department soon accumulating huge reserves of strategic materials. 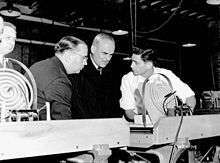 During the Second World War, Howe established 28 Crown Corporations, which did everything from managing secret projects to manufacturing the machine tools the rest of Canadian industry needed to keep going. These corporations were not responsible to Parliament, but to Howe himself. Parliament received no word of their activities unless Howe mentioned them. Bothwell and Kilbourn describe Howe's speech opening the Pipeline Debate as "probably the best of his career". He told the Commons that waiting a year would be imprudent, given the worldwide shortage of steel pipe, and unfair to those who owned natural gas wells in western Canada, which were presently capped. Howe told the House he believed this to be a great project, "of truly national scope, which we must either launch now or see languish for years to come. "[lower-alpha 5] He completed his address by giving notice that the following day, the Government intended to invoke closure. Social Credit, with many members from Alberta, supported the bill, while the Tories and CCF engaged in weeks of bitter debate and parliamentary wrangling. This culminated on 1 June, dubbed by the Tories "Black Friday", when Speaker René Beaudoin reversed a ruling he had made the previous evening which would have allowed the Opposition to continue the debate past the deadline. The Opposition accused the Speaker of yielding to Government pressure. The bill passed within the deadline, and construction on the pipeline began immediately. Howe wrote, "I should not like to face a general election at this moment. Fortunately we do not have to." Prime Minister Diefenbaker said after Howe died, "We often had strong differences but our personal relations remained most friendly at all times.... He gave his great ability, indomitable courage and energy to his country in a manner that has earned for him and will assure him of a large place in the history of Canada's war effort." After Howe's death, the C. D. Howe Memorial Foundation was created in his memory; the C. D. Howe Institute, a Canadian economic policy think tank was at one time associated with the Memorial Foundation. The Canadian Aeronautics and Space Institute (CASI) introduced the C. D. Howe Award for achievements in the fields of planning and policy making, and overall leadership in the field. In 1976, Howe was inducted into Canada's Aviation Hall of Fame, in honour of his contribution to creating a national airline and efforts to create and sustain a viable aviation industry. 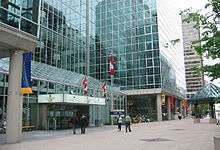 The C. D. Howe Building, located at Bank and Sparks Street in Ottawa, is the home of Industry Canada and is named for the former minister. 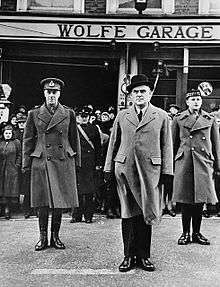 ↑ Howe's portfolios were combined in late 1936 into the new Ministry of Transport. ↑ Of the 15 men sworn in that day, Howe was the only man to still be in Cabinet office when the Liberals were defeated in 1957, although James G. Gardiner, whose appointment to the Cabinet was delayed 12 days as he first had to resign as Premier of Saskatchewan, would be Howe's Cabinet colleague until the Liberal defeat. ↑ Trans-Canada Air Lines changed its name to Air Canada in 1965, and is still in operation. ↑ The "dollar-a-year club was also derisively known as "Howe's Boys". The Order of the British Empire (OBE) was bestowed on 13 of "Howe's Boys" in 1946. 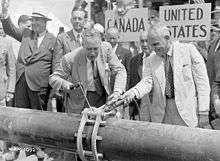 ↑ Howe considered the Pipeline project, like the Seaway, represented a "great development project" that would serve to stimulate the economy. ↑ "The War Economy and Controls: C.D. Howe." Canadian War Museum. Retrieved: 6 August 2013. ↑ Harbron 1980, pp. 7–9. ↑ Harbron 1980, pp. 10–12. ↑ Bothwell & Kilbourn 1979, pp. 22–23. ↑ Harbron 1980, pp. 13, 15. ↑ Roberts 1957, p. 18. ↑ Bothwell & Kilbourn 1979, p. 26. ↑ Bothwell & Kilbourn 1979, p. 27. ↑ Bothwell & Kilbourn 1979, p. 29. ↑ Roberts 1957, p. 19. ↑ Bothwell & Kilbourn 1979, p. 30. ↑ Bothwell & Kilbourn 1979, pp. 32–33. ↑ Harbron 1980, pp. 16–18. ↑ Bothwell & Kilbourn 1979, pp. 37–38. ↑ Roberts 1957, pp. 19–20. ↑ Bothwell & Kilbourn 1979, p. 41. ↑ Bothwell & Kilbourn 1979, p. 42. ↑ Bothwell & Kilbourn 1979, pp. 42–43. ↑ Bothwell & Kilbourn 1979, pp. 46–48. ↑ Roberts 1957, p. 17. ↑ Bothwell & Kilbourn 1979, pp. 50–51. ↑ Harbron 1980, pp. 23–24. ↑ Bothwell & Kilbourn 1979, p. 55. ↑ Bothwell & Kilbourn 1979, p. 56. 1 2 Roberts 1957, p. 10. ↑ Bothwell & Kilbourn 1979, p. 62. ↑ Harbron 1980, p. 24. ↑ Bothwell & Kilbourn 1979, p. 66. ↑ Bothwell & Kilbourn 1979, p. 81. 1 2 3 Roberts 1957, pp. 7–8. ↑ Roberts 1957, pp. 24–26. ↑ Roberts 1957, pp. 27–32. ↑ Roberts 1957, p. 30. ↑ Smith 1986, pp. 33–34. ↑ Harbron 1980, p. 30. ↑ Render 1999, pp. 250–251. ↑ Harbron 1980, pp. 35–36. ↑ Roberts 1957, pp. 49–50. ↑ Pigott 2001, pp. 38–39. 1 2 Bothwell & Kilbourn 1979, p. 113. ↑ Stevenson 1987, p. 198. ↑ CBC News 14 May 2004. ↑ Roberts 1957, pp. 63–64. ↑ Roberts 1957, pp. 72–73. ↑ Bliss 2004, p. 165. ↑ Roberts 1957, pp. 74–75. ↑ Bothwell & Kilbourn 1979, pp. 126–127. ↑ Bothwell & Kilbourn 1979, pp. 128–129. ↑ Harbron 1980, p. 37. ↑ Roberts 1957, p. 80. 1 2 Stewart 1998, p. 43. ↑ Roberts 1957, p. 85. ↑ Roberts 1957, pp. 82–83. ↑ Harbron 1980, pp. 44–45. ↑ Stewart 1991, pp. 23–24. ↑ Stewart 1991, p. 24. ↑ Stewart 1991, p. 14. ↑ Nichols 1987, pp. 97-98. ↑ Roberts 1957, p. 87. ↑ Roberts 1957, p. 119. ↑ Roberts 1957, p. 120. ↑ Roberts 1957, p. 155. 1 2 Bothwell & Kilbourn 1979, p. 240. ↑ Smith 1995, p. 165. ↑ Harbron 1980, p. 48. ↑ Thomson 1967, p. 141. 1 2 Roberts 1957, pp. 148–149. ↑ Bothwell & Kilbourn 1979, p. 198. ↑ Bothwell & Kilbourn 1979, pp. 202–203. ↑ Bothwell & Kilbourn 1979, p. 206. ↑ Roberts 1957, p. 153. ↑ Roberts 1957, p. 151. ↑ Roberts 1957, p. 158. ↑ Stewart 1998, pp. 45–46. ↑ Bothwell & Kilbourn 1979, p. 190. ↑ Bothwell & Kilbourn 1979, pp. 209–211. ↑ Thomson 1967, p. 204. ↑ Thomson 1967, pp. 210–211. ↑ Thomson 1967, p. 215. ↑ Thomson 1967, p. 225. ↑ Bothwell & Kilbourn 1979, pp. 218–219. ↑ Roberts 1957, p. 163. ↑ Bliss 2004, p. 177. ↑ Smith 1995, pp. 167–168. ↑ Smith 1995, p. 174. 1 2 Bothwell & Kilbourn 1979, pp. 242–243. ↑ Bothwell & Kilbourn 1979, p. 259. ↑ Bliss 2004, p. 178. ↑ Bothwell & Kilbourn 1979, p. 253. ↑ Bothwell & Kilbourn 1979, p. 255. ↑ Fraser 1967, p. 127. ↑ Roberts 1957, pp. 179–181. ↑ Roberts 1957, p. 183. ↑ Bliss 2004, p. 179. ↑ Newman 1963, p. 36. ↑ Bliss 2004, pp. 181–182. ↑ Bothwell & Kilbourn 1979, p. 266. ↑ Bothwell & Kilbourn 1979, pp. 278–281. ↑ Bliss 1994, pp. 527–528. ↑ Bothwell & Kilbourn 1979, pp. 283–285. 1 2 Thomson 1967, pp. 396–397. ↑ Bothwell & Kilbourn 1979, p. 299. ↑ Bothwell & Kilbourn 1979, pp. 299–300. ↑ Bothwell & Kilbourn 1979, p. 301. ↑ Roberts 1957, p. 189. ↑ Thomson 1967, pp. 401–403. 1 2 Newman 1963, p. 37. 1 2 Harbron 1980, pp. 55–56. ↑ Thomson 1967, p. 424. ↑ Bothwell & Kilbourn 1979, p. 312. ↑ Thomson 1967, p. 420. ↑ Bothwell & Kilbourn 1979, p. 316. ↑ Bothwell & Kilbourn 1979, p. 309. 1 2 Bothwell & Kilbourn 1979, pp. 309–311. ↑ Bliss 1994, p. 483. ↑ Roberts 1957, pp. 218–220. ↑ Thomson 1967, pp. 434–436. ↑ Harbron 1980, p. 56. ↑ Bothwell & Kilbourn 1979, p. 317. ↑ Thomson 1967, p. 493. ↑ Bothwell & Kilbourn 1979, pp. 266–267. ↑ Bothwell & Kilbourn 1979, p. 327. ↑ Bothwell & Kilbourn 1979, pp. 324–325. ↑ Newman 1963, p. 55. ↑ Bothwell & Kilbourn 1979, p. 325. ↑ Meisel 1962, p. 59. ↑ The Vancouver Sun 24 May 1957. ↑ Bothwell & Kilbourn 1979, p. 328. ↑ Bothwell & Kilbourn 1979, pp. 328–329. ↑ Bothwell & Kilbourn 1979, p. 329. ↑ Bothwell & Kilbourn 1979, p. 330. ↑ Harbron 1980, p. 62. ↑ Bothwell & Kilbourn 1979, pp. 333–334. ↑ Thomson 1967, pp. 525–526. ↑ Bothwell & Kilbourn 1979, pp. 336–338. ↑ Bothwell & Kilbourn 1979, p. 338. ↑ Bothwell & Kilbourn 1979, pp. 338–339. ↑ Bothwell & Kilbourn 1979, p. 340. ↑ Bothwell & Kilbourn 1979, pp. 342–344. ↑ Bothwell & Kilbourn 1979, pp. 346–347. 1 2 3 Ottawa Citizen 3 January 1961. ↑ Pigott 2001, p. 417. ↑ C. D. Howe Institute, History. ↑ Oswald 1999, p. 99. ↑ Bothwell & Kilbourn 1979, p. 349. "Funeral Tomorrow: C.D. Howe Dies, Cabinet Minister 22 Years". Ottawa Citizen. CP. 3 January 1961. p. 9. Retrieved 14 December 2010. "C.D. Howe Award". Canadian Aeronautics and Space Institute. Retrieved 26 March 2012.